Gisborne were a late withdrawal on Saturday night. It was a chance t have a great practice run thanks for everyone who came down and participated. Another good battle and a good win with a number of our strong players on Kangas duty today. I was particularly pleased to see a number of players playing in defence today who had not been playing there previously, including Milla and Zoe returning from Kangas duty, and who did a really great job. Some good clearing kicks and some excellent running with the ball from all players. Well done also to our two goalies today who did very well. That's 4 in a row for the Joeys and two games in a row without letting a goal in. Very impressive. Strong showing again this week from our girls against Spring Hills FC. Support this week from Sophie, Kitty, Mia and Charli. Our first half goalie April was magnificent and we went to half time 1-0 after a great goal from Rozie after a wonderful cross from Ishi on the left wing. The second half we were unstoppable and kicked 3 more goals - great work Annabel and April. Out mid-field and backlines were unable to be penetrated for most of the game - and Ishi in golas hardly touched the ball in the 2nd half. Keep up your fantastic passing and support play girls its a pleasure to watch. 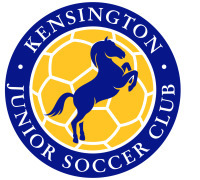 Early Sunday morning Kensington Junior Girls Under 12’s played against the top team in the league Barnstoneworth United. The end result of the game was a nil all draw. The game was a great spectacle and the result in the end could be considered fair. The first half of the game was fairly even with Barnstoneworth United slightly edging possession and positioning on the park. However the second half was dominated by Kensington. Towards the end of the game the girls had their chances to convert their dominance into scoring opportunities. In the second half both Hollie and Delali came close to breaking the deadlock. A stunning free kick from a good twenty yards out by Delali looped over the wall and bent inches wide of the wrong side of the right post. In another move starting from some brilliant passing out of the backline and through the midfield line resulted with Hollie using her skills to shimmy past the advancing sweeper, she broke clear using her pace and was unlucky to be closed down by the goal keeper. On another positive note it was the first time this year that the girls did not concede a goal. Fantastic game by all the girls. Special mention to Alicia in midfield for her poise and vision on the ball, in converting defence into attack. Her talk on the field was exceptional. Kristine / Keeley for their roles as sweeper in marshalling and leading the defence to not concede a goal. I am extremely proud of the girls efforts. Keep on fighting, chasing, helping your teammates and trying. Girls, the results and goals will come our way if we keep doing the basics. U14C girls played against Point Cook today and despite a massive effort by all our girls right until the final whistle they were defeated 10 - 0. 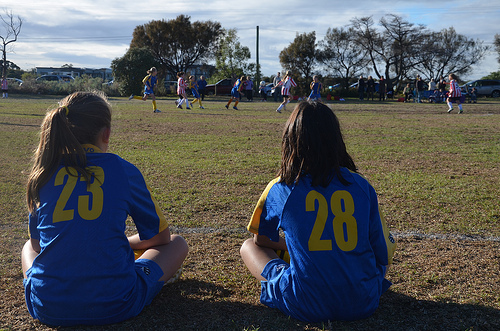 Alessia and Kira did a great job in Goals stopping another 20 goals between them, Our girls came off happy and exhausted. This week U14B again came up against a very skillful team. Though we'd warmed up physically it took us a while before we mentally switched on, making our second half much better than the first half. Our keepers, Ruby and Liv were in fine form, making many difficult saves, Georgia was consistent is clearing out of our defence and Tara, Elena and Emma made confident runs with the ball forward. But what was most impressive about U14B was their sportsmanship and respect for the referee. When her opponent fell down, Tara stayed and comforted her until she was carried off. Then at the end of the game our whole team cheered and thanked the referee, a 14 year old girl who was somewhat unsettled after being harassed during the game by our opponents and their coach. The girls should be so proud of their excellent display of character on and off the field. Game against Ballarat Devils has been moved to play on the CU2 weekend of 9 June at 10.30am at Holland Park.